Family Forward NC is an innovative initiative to improve children’s health and well-being and keep North Carolina’s businesses competitive. It is business-led change to increase access to research-based, family-friendly practices — big and small — that improve workplace productivity, recruitment and retention; grow a strong economy; and support children’s healthy development. Watch our Family Forward NC video. Providing breastfeeding support and flexible work schedules reap significant returns on investment for business and families alike. Employee absenteeism racks up big costs. Backup childcare enables employees to continue working when normal childcare falls through. 83% of employees with backup care worked an average of one day per month they would have otherwise missed. Telecommuting is a win-win for businesses and families. 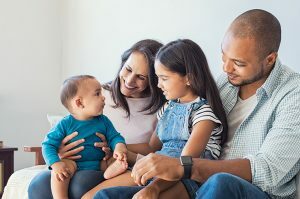 Paid leave for mothers and fathers for the birth or adoption of a child is a game-changer for businesses and families. Millennial workers are less likely to quit an employer who offers paid parental leave and increased flexibility. The median cost of replacing an employee is 21% of that employee’s annual salary. Women who have access to paid leave work 2 to 3 hours more per week after returning to work. Lower infant mortality rates. NC has one of the highest rates in the nation. Financial stability. Lack of paid family leave forces approximately 8.6% of US households into poverty. Download our booklet that details all the research-based opportunities for businesses to offer family-friendly workplaces. Family-friendly benefits make businesses competitive in hiring and retaining qualified workers. This is especially relevant given that retiring Baby Boomers are vacating jobs faster than younger workers can replace them, and one in four North Carolinians are 25-44 — prime child bearing and working years. Family-friendly business policies also help children build a strong foundation for future academic and career success through improved access to high-quality health care, education, and family economic security. And employers in North Carolina and across the country face growing challenges in hiring qualified workers due to a skills gap. Within the next two years, an estimated 5 million jobs will go unfilled. Join us in strengthening the state we call home.